Marine Drive is considered to be one of the most beautiful parts of the city. It is also called Shanmugham Road. The marine walk is the main hangout for the local populace as the view of the backwaters and the harbor from here is excellent. At night the lights from the various ships anchored at the harbor is just breathtaking. There are various buildings along the Marine Drive which are good examples of modem architecture with the notable one being Asoka Apartments on the southern end of the Marine Drive with a huge Namaste, the traditional greeting. No vehicles are allowed here in the walkway, which is facing the backwater, giving the most wonderful evening experience. The history of marine drive dates back to 1980s. Till then, it was Shanmugham road. It was in 1980's, Greater Cochin Development Corporation (GCDA) started Kochi Marine Drive Project. Thus was born the revamped and the new Marine Drive of Kochi. 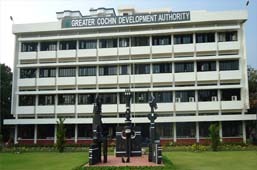 The plan of GCDA was to construct a road in the western border of the land, but due to some legal issues, it didn't happened. Thus they planned the marine walkway and today Marine Drive is not just the walkway but the whole locality. Marine Drive is from Jankar Jetty in the north to Ernakulam Boat Jetty in the South. Public Ground, Skyline apartments, Federal bank building, GCDA shopping complex, priyadarshini children's park etc are the adjoining areas. They are between the walkway and shanmugham road. Most of the important exhibitions and public functions are held at public ground, near Marine Drive. 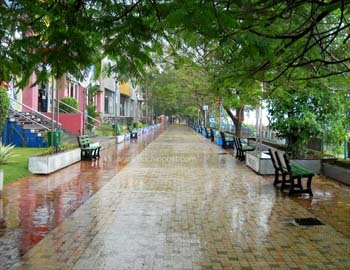 The walkway is one of the most selected destinations in Kochi. A slow and lazy walk through the walkway, hearing soft music is something which will refresh your mind. 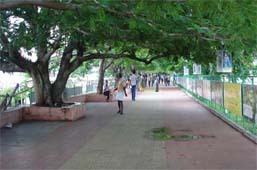 The marine walkway stretches from Subash Chandra Bose Park to the KSINC Boat Jetty. Both Rainbow Bridge and Chinese Fishing Net Bridge are two important bridges of Marine Drive. Rainbow Bridge is over the market canal road near GCDA complex and Chinese Fishing Net Bridge is over the Mullashery Canal near children's park. The view of the Kochi backwaters from these bridges is a stunning sight. 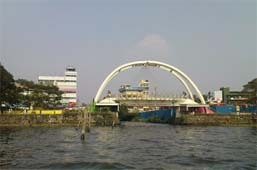 The Kettuvallam Bridge is the new landmark of the city Kochi. The new bridge is at the end of the marine walkway, near to the Goshree bridge. The 700 m long and 12 m wide bridge was inaugurated in 2013. the bridge in the shape of a traditional 'Kettuvallam' and thus got the name 'Kettuvallam'. There is a restaurant and refreshment centre over the bridge. 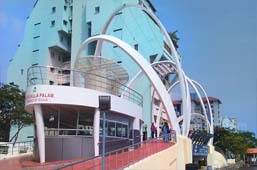 The GCDA complex is one of the unique feature of Marine Drive. The 214 room shopping complex is a heaven for shopaholics. This huge two-storied building complex in the central of the city attracts people from different parts of the country. You can find here electronic shops, cafes, restaurants, handicrafts shops etc. The Marine Drive is gradually catching up as another busy retail center. The lively GCDA Commercial Complex along the waterfront features a kaleidoscope of several business establishments and other institutions, fast foods and cafes, and a variety of shops selling anything from perfumes to high-capacity refrigerators. Luxury apartments, elegant hotels, and office buildings are located on either side of the main Shanmugham Road which terminates at High Court Junction on the northern end, where the Ram Mohan Palace - the seat of the Kerala High Court - is situated. An evening stroll along the water-side promenade is a favorite pastime. Broadway - narrow despite its name - running parallel to the east of Shanmugham Road is among the city's oldest and busiest shopping streets, where the best buys include clothes and spices. The main Ernakulam market is also located alongside Broadway.